My instagram here maimairuru instagram I want to write here about my handmade life. For the lunch of today, I made some Rice balls. 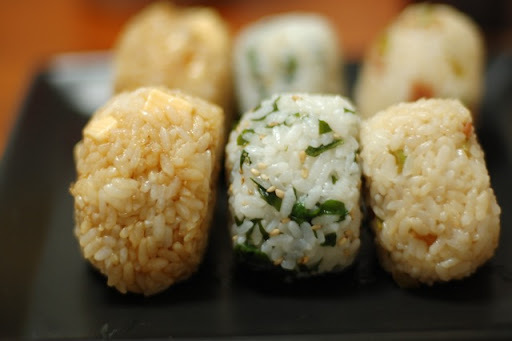 The best Onigiri for me is the one with only some salt. I don't need any filling or any seaweed. Because I like the taste of rice very much, and I like eating them with some other small dishes. Today, I had some ideas of Onigiri, so I put fillings to all Onigiri. The left one has dried bonito flakes, smoked cheese and a bit of soy sauce. And the center one has wakame seaweed, sesames and saled cod roe in the center. For the last one, I flied some leaves of Japanese radish, bacon and a piece of garlic. I tasted it with some soy sauce and mixed them with rice. Oh, I found the other dream. It's to open an Onigiri shop in Italy! Hello Mai, and congratulations for all your creations! It is very impressive, I like your work, full of freshness. I live in Amsterdam and I don't know where to find some nice fabrics like the japanese ones... Is there any fabrics that you miss and could be found here, so that we could swap? Thank you for your comment, and I'm happy if we can swap some fabrics! I'll send you an e-mail! Hi Mai. I was looking from google for how to make origami kimono & stumble to your blog. Lovely blog you got here. I didn't know much about Brunei Darussalam, so I looked up some information. I'm not professional of Origami, but when I find some new instructions, I'll put here. I'm happy to know people from Brunei! Thank you! Just found your blog from your etsy shop. I love your stuff and I'm going to have to try those rice balls. Looking forward to reading more and keeping up on your new creations. I want to write more instructions about my craft. Thank you! Those look delicious! How do you get the shape right? My daughter makes these for her lunchbox sometimes... She is part Japanese but has red hair ... She likes to bring special Japanese things in her lunch or art folder to confound her friends who forget that she's Japanese! hi very nice, thank you so much!!! My name is Mai. I'm Japanese. I have a shop on ETSY. I love eating, reading and using my hands. I live with my husband Haru, my daughter Miyu and my son Kou. My e-mail is maimairuru(at)gmail(dot)com . Please feel free to contact me (* v *)!!!! I sewed a whale shaped pouch. But my boyfriend said it was an elephant. Mmmmm,,, It's a whale, because it has a big mouth!